Do you need to Drug Test a Substance? Need to identify a Suspicious Substance that you think might be drugs? Do you need to Drug Test a Surface? Do you suspect a Meth Lab? 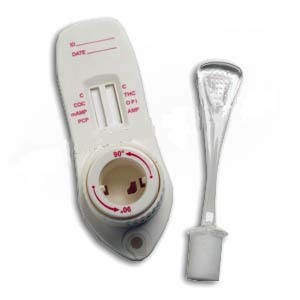 METH-X - single drug test kit for the detection and identification of Methamphetamines. Perfect for detecting or identifying meth labs (was your house previously a meth lab? Don't guess, know for sure!). See our Meth Lab | information below. Hashish and Marijuana, PCP, Pure Heroin, Opium, Buprenorphine, LSD, Methadone, Amphetamines, Methamphetamines and Ketamine. Our collection of Drug Detection & Identification Products provides law enforcement officers, investigators and private entities distinct advantages for field use. Our substance drug test - surface drug tests are first and foremost non-toxic, non-carcinogenic and will not harm the environment. In addition, they insure a testing process whish is convenient, fast and efficient. Results appear in seconds. The Identification & Detection process requires no special training and testing can be performed "on the spot." As simple as 1, 2, 3!. Easy to carry and use - no special training required! Non toxic, no corrosive substances, no acid, no special disposal required. 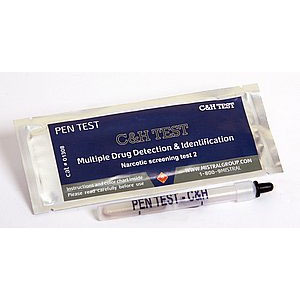 METH-X - a single drug test kit for the detection and identification of Methamphetamines on multiple surfaces. This is the test to determine if your house was used as a Meth Lab. This test can also be used to test a suspicious substance (powder, residue, etc) to see if it is methamphetamine, ecstasy, etc. 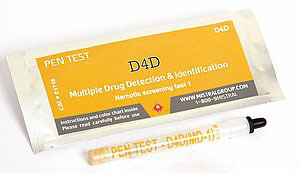 D4D (MD-1) - is a multi-drug test kit that detects and indentifies several drugs at once: Hashish and Marijuana, PCP, Pure Heroin, Opium, Buprenorphine, LSD, Methadone, Amphetamines, Methamphetamines and Ketamine. 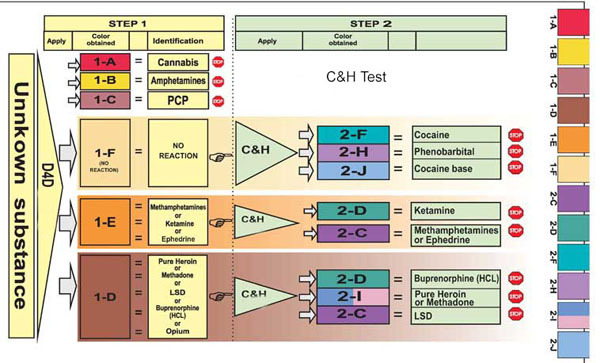 C&H (MD-2) - is a multi-drug test kit that detects and indentifies several drugs at once: Cocaine, Cocaine Base (Crack), Ketamine, Buprenorphine, Pure Heroin, Methadone, Methamphetamines, and LSD. Can also identify Quinine, Diphenhydramine, Ephedrine, Pseudoephedrine and Thebaine. What are the potential health effects from exposure to a meth lab? Meth can be manufactured in a clandestine drug lab (meth lab) in a variety of indoor and outdoor locations, including houses, apartment buildings, motels, vehicles, wooded areas or fields. Meth is manufactured (or "cooked") by applying common, readily available materials to one of several basic recipes. Meth "recipes" can be easily obtained through the Internet or by associating with other cooks. There are hundreds of chemical products and substances that are used interchangeably to produce meth. The substitution of one chemical for another in meth recipes may cause the process to be more hazardous (resulting in fire or explosion) or may result in a tainted, final product with unwanted or dangerous effects. Many dangerous chemical ingredients are used to make meth. The cooking process causes chemical residues and meth to be deposited on surfaces and household belongings. Also, chemical by-products such as toxic phosphine gas may be formed during meth manufacture. This may occur through planned chemical interaction, or by processing errors, such as increasing cooking temperatures too rapidly. Every meth "recipe" starts with over-the-counter medications that include pseudoephedrine or ephedrine in their contents. The pills are crushed and mixed with other chemicals in the process of cooking meth. Various meth recipes include combinations of volatile organic compounds (VOCs), acids, bases, metals, solvents and salts. Making meth with these chemicals can result in explosions, chemical fires, and the release of toxic gases. Health effects caused by exposure to meth lab chemicals depend on: (1) the lab process and chemicals used; (2) the amount of chemical and length of exposure; and (3) the age and health of the person exposed. Chemicals may enter the body by being breathed, eaten, or absorbed through the skin..
An acute exposure is one that occurs over a relatively short period of time. Acute exposure to meth lab chemicals can cause shortness of breath, cough, chest pain, dizziness, lack of coordination, chemical irritation, or burns to skin, eyes, nose and mouth. Death could result when exposure is to a particularly toxic chemical or the person exposed is particularly vulnerable. Acute exposures can occur in non-drug users during or immediately after "cooking". Less severe exposures can result in symptoms such as headache, nausea, dizziness, and fatigue or lethargy. These symptoms have been known to occur in people exposed to active labs, but also in people --- particularly law enforcement personnel and other first responders --- who have entered a drug lab before the site has been cleaned or ventilated. These less-severe symptoms usually go away after several hours of exposure to fresh air. Exposures to lab chemicals or byproducts over a long period of time - called chronic exposures - may cause both long-term and short-term health effects. Long-term exposures to VOCs may result in liver and kidney damage, neurological problems, and increased risk of cancer. Even at low levels, exposures for long periods by people living in a former lab site could result in serious health effects. An individual who believes he or she has discovered an illegal drug lab or the site of an abandoned lab should immediately notify local law enforcement (Dial 911) and should not enter the area of the suspected lab. Anyone who inadvertently enters a lab should back out immediately without disturbing the cooking process, chemicals or equipment..